Getting Started with your DidySling! The DidySling is an easy-to-use baby carrier that is fully adjustable and suitable for newborns to toddler. 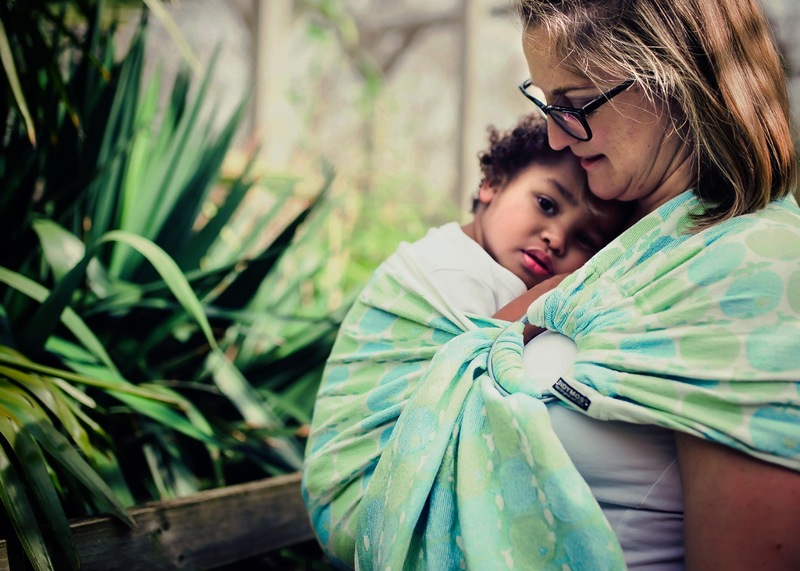 The beautiful fabrics of the Didymos woven wraps are also offered for the DidySling ring sling carriers. The DidySling offers all the benefits of the woven wrap characteristics such as support, diagonal stretch, durability and high quality. A ring sling may not be as versatile as a classic baby wrap, however, it is very convenient and easy to use. The ease of being able to pop baby in and out quickly makes this a very popular method of carrying your baby! It is an excellent carrier for newborns, for older babies who are eager to see the world in a hip carry, and for quick “ups & downs” with toddlers. If you have not already read the recommended safety guidelines, please start here! Thread the sling by pulling the tail of the fabric through the middle of both rings and then back again over the outside ring and through the middle of the inside ring. Ensure the fabric is spread evenly through the rings and that the two rails – both inside and outside are not overlapped. The rails should be visible and accessible in order to easily adjust the sling. If the fabric is not lying evenly through the slings, this can make adjusting thefabric more difficult and could cause the sling fabric to slip later on. Therefore, troubleshoot by loosening the fabric between the rings by pulling up on the bottom ring and gently lifting a bit of the fabric out. Spread the fabric between the rings by walking it through over your thumb from rail to rail. Pull the tail down back through the rings again. Click on the Instructions for a full PDF featuring step by step picture tutorials written by Didymos! The process is simple: you put on the sling, place baby inside it, and tighten using the rings. The DidySling makes it easy to carry your child on your front, hip and even the back. We recommend the DidySling be used as a front carry only until baby has adequate core, neck and head control before transitioning to the hip and back. Wrap you in Love shows the basics in her video. She is spectacular with her adjusting techniques. We have a wide selection of DidySling colours, patterns, fabric blends to choose from.